A new book on the Roman conquest of Greece – which ends in the destruction of Corinth. Coming April 2014. Waterfield, Robin. 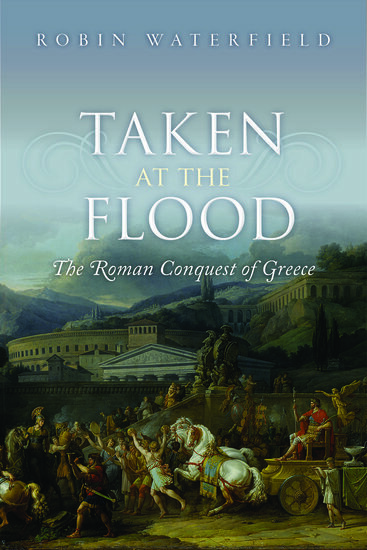 Taken at the Flood: The Roman Conquest of Greece. New York: Oxford University Press, 2014. The 53-year period Polybius had in mind stretched from the start of the Second Punic War in 219 BCE until 167, when Rome overthrew the Macedonian monarchy and divided the country into four independent republics. This was the crucial half-century of Rome’s spectacular rise to imperial status, but Roman interest in its eastern neighbors began a little earlier, with the First Illyrian War of 229, and climaxed later with the infamous destruction of Corinth in 146. Taken at the Flood chronicles this momentous move by Rome into the Greek east. Until now, this period of history has been overshadowed by the threat of Carthage in the west, but events in the east were no less important in themselves, and Robin Waterfield’s account reveals the peculiar nature of Rome’s eastern policy. For over seventy years, the Romans avoided annexation so that they could commit their military and financial resources to the fight against Carthage and elsewhere. Though ultimately a failure, this policy of indirect rule, punctuated by periodic brutal military interventions and intense diplomacy, worked well for several decades, until the Senate finally settled on more direct forms of control.